Malaysia's king has abdicated, royal officials said Sunday, in a historic first for the country that ended weeks of speculation about his future after he took medical leave. Sultan Muhammad V's decision marks the first time a king has abdicated in the Muslim-majority country since it gained independence from Britain in 1957. "His majesty tells the people of Malaysia to continue to be united to maintain unity, tolerance, and work together," said the statement, signed by the Comptroller of the Royal Household, Wan Ahmad Dahlan Abdul Aziz. It gave no reason for the 49-year-old's move. Reports then circulated online that he had married a former Miss Moscow in Russia. Royal officials in Malaysia have so far not commented on the rumoured marriage, or given any details about his health condition. 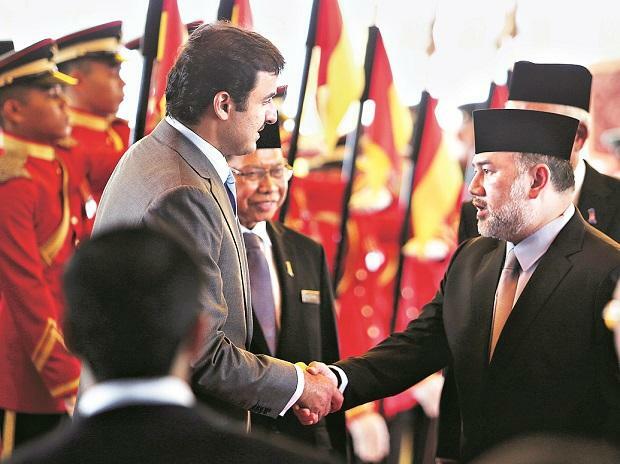 While their role is ceremonial, Malaysia's Islamic royalty command great respect, especially from Muslim Malays, and criticising them is strictly forbidden. Speculation intensified about the king's future this week when the country's Islamic royals reportedly held a special meeting. The rotating monarchy system has been in place since independence from Britain in 1957, and Sultan Muhammad V is the first monarch to have renounced the throne. Sultan Muhammad V studied at St Cross College at Oxford and the Oxford Centre for Islamic Studies, according to official media.